365 blessings, organized by season, to make every mealtime more nourishing. From a wide variety of traditional and contemporary sources, this collection of blessings and aphorisms emphasize the universal spirit present in all things, big and small. Organized by season, each quote captures the challenges and delights pertaining to the time of year, whether it be the bounty of autumn, the darkness of winter, the rebirth of spring, or the freedom of summer. 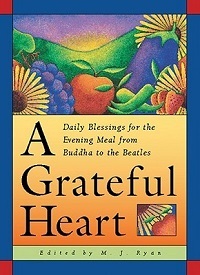 Turn to A Grateful Heart for your daily mantras and mealtime graces, and nourish the spirits of you and your loved ones.